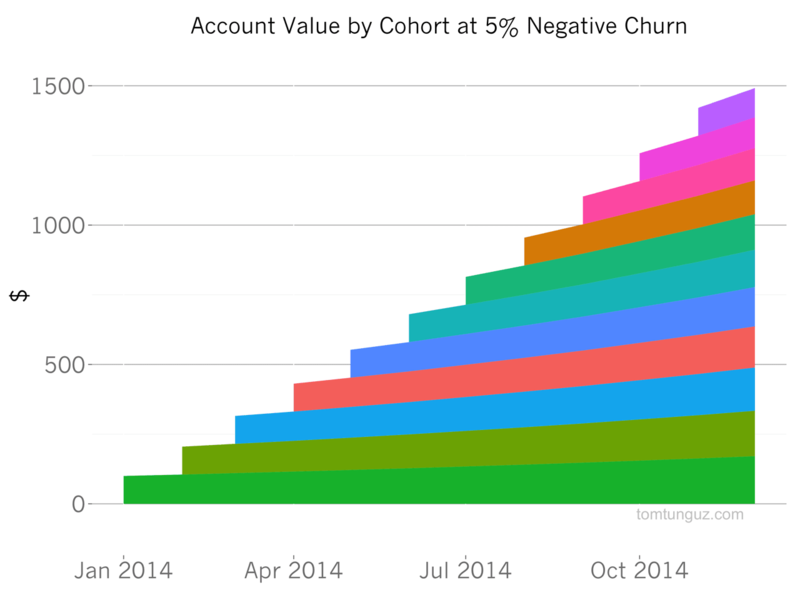 Negative churn is an incredibly attractive characteristic of a SaaS company because it means that customer accounts are like high-yield savings accounts. Every month, more money comes in, without much effort. This is a powerful effect and can fuel SaaS companies to huge success, as we saw in New Relic’s S-1. The concept of negative churn is a bit amorphous so let’s illustrate the impact on a startup. The chart above plots the revenue growth of a hypothetical SaaS company for a year. This startup acquires 100 customers per month, each paying $1 per month to use the product. And the company loses 5% of those customers each month, so only about half of the January cohort remains in December. Contrast this with a company which has achieved 5% negative churn. In other words, the company still loses 5% of its customer base each month, but the remaining 95% of the customers grow their spend with the startup by 10 percentage points, so the total revenue from the cohort is equal to 105% of the revenue from the previous month. Like a savings account, each month, every cohort becomes more valuable. 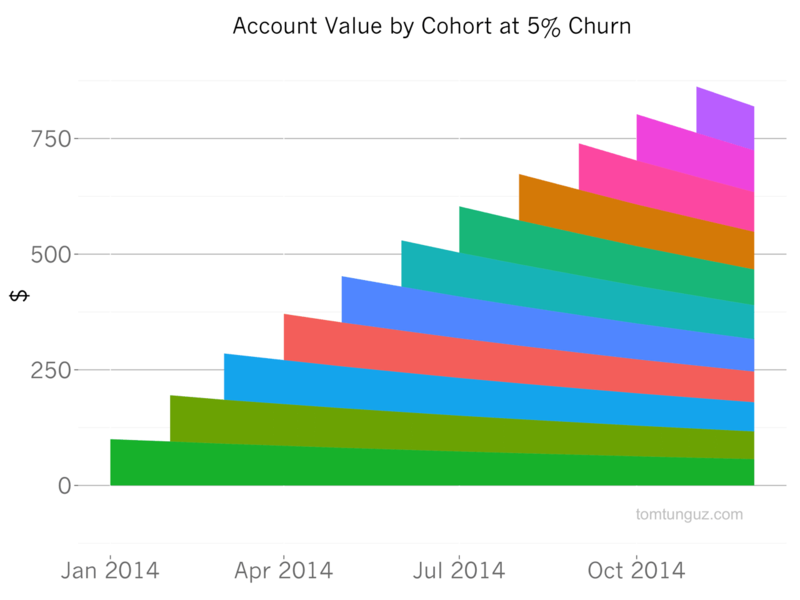 In the 5% monthly churn case, the startup exits 2014 with $919 in MRR (monthly recurring revenue) and the typical customer is worth $77. In the negative churn case, the startup’s revenue is 73% larger at $1592 and the average customer is worth $133. But I suspect there are other categories, too. And of course, in many cases, the customer success team is responsible for this type of expansion. There are some important nuances to negative churn as Ferenc points out in his post on the topic. Namely, negative churn is an average and for most companies, customers’ revenue follows a power law distribution (the old 80⁄20 rule where 20% of customers generate 80% of revenues). So one customer can create negative churn if that customer’s spending increases dramatically. Meanwhile, the company may hemorrhaging the majority of its customer base. Looking only at revenue churn wouldn’t reveal the potential cataclysm. This is why it’s important to pay attention to both revenue and account churn. Combined with annual prepay contracts, negative churn is a very powerful growth mechanism. When thinking through your pricing model and your customer success strategy, it’s worth trying to engineer negative churn into your startup.